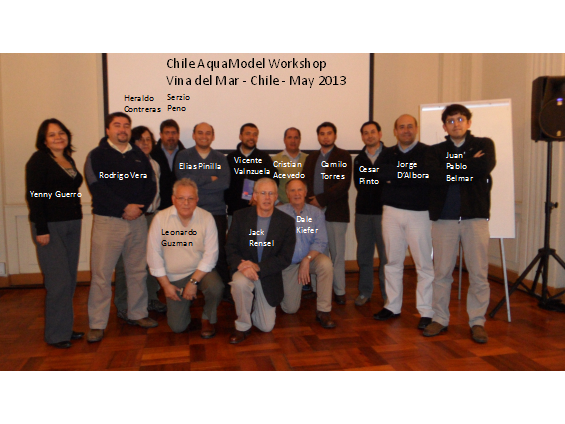 A four day AquaModel training workshop was presented in Vina del Mar, Chile in early May 2013 for scientists and representatives of the Chilean Subsecretaria de Pesca (SubPesca), Servicio National de Pesca (Sernapesca) and Instituto de Fomento Pesquero (IFOP). These agencies hosted Dr. Rensel and Dr. Kiefer and visits were made subsequently to freshwater and marine culture facilities in other areas near Puerto Montt. The meetings concluded with an agreement to continue collaboration and possible testing of AquaModel in Chile as a means to enhance monitoring and management of near and far field effects of fish aquaculture.